Blue Bamboo was originally released by Kodansha USA, but was recently reissued by Kurodahan Press. 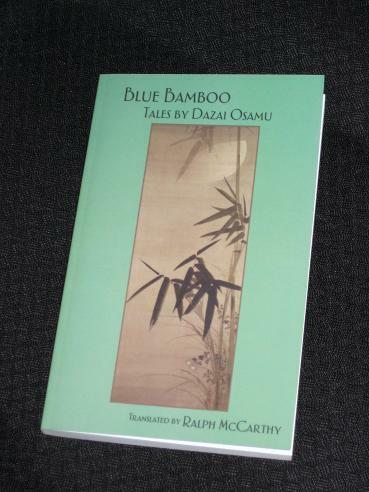 It‘s a collection of short stories from Dazai’s middle period of writing, and this reissue gave the original translator, Ralph McCarthy, the opportunity to give his work a bit of a face-lift. Its 200 pages comprise seven stories, and while Dazai’s longer work is steeped in depressing realism, these tales have a much lighter, other-worldly focus. Two of the stories (‘The Chrysanthemum Spirit’ and ‘Blue Bamboo’) are loose adaptations of old Chinese folk tales. In the first, a stubborn, cantankerous old man, with a passion for growing chrysanthemums, encounters an unusual brother and sister combination on his way home. What follows is an amusing little story involving pretty flowers and the supernatural, not a sentence I find myself writing often! ‘Romanesque’ is an earlier piece, again verging on the surreal, as Dazai outlines the lives of three absurd characters (a wizard, a fighter and a liar) in order to… well, I’m not really sure. This story is then mentioned in ‘Alt Heidelberg’, an autobiographical sketch of a youthful, drunken summer spent at a friend’s house trying to write a story. It’s well written and humorous, and, in its more realistic tone, a welcome contrast to some of the other stories in the collection. This is exactly what Dazai does, and the story works wonderfully precisely because the reader has a clear mental image of the family members. Obviously, I haven’t read McCarthy’s original translation, but I’m sure that whatever he did was for the better! I've got a copy of Crackling Mountain and Other Stories to read next and then I think I'll turn to this, Romanesque sounds intriguing!. This is a great title to keep in mind for reading Japanese short stories. When I first began this sub-genre, I was annoyed because I was so used to American stories with a beginning, middle and end. But I have since come to LOVE Japanese short stories, and the one you described about becoming a raven and exploring the idea of receiving what you want sounds fascinating. We often rue the very idea once it's ours. me. – They're all good stories 🙂 Dazai is definitely a writer more people should try. I read 'The Setting Sun' a good while ago now, so I don't remember too much about it (other than that it was good!). I think that it's about time I started rereading some of the J-Lit I first tried a few years back. Of course, the Oxford book is *the* place to start! Happy to see so much interest in Dazai! Great review Tony, and I'm glad you enjoyed it. One of the reasons I recommended it when I wrote about Dazai in January is because it is a departure from what one not overly familiar with Dazai might expect. Unfortunately, a lot of his stuff is out of print and hard to find, even used. In case you are interested, I have the most complete list of his short stories translated into English on my blog. I've read and enjoyed two of Dazei's books, No Longer Human and Schoolgirl, and this is another I've been meaning to get around to. Definitely one of my favourite Japanese writers.